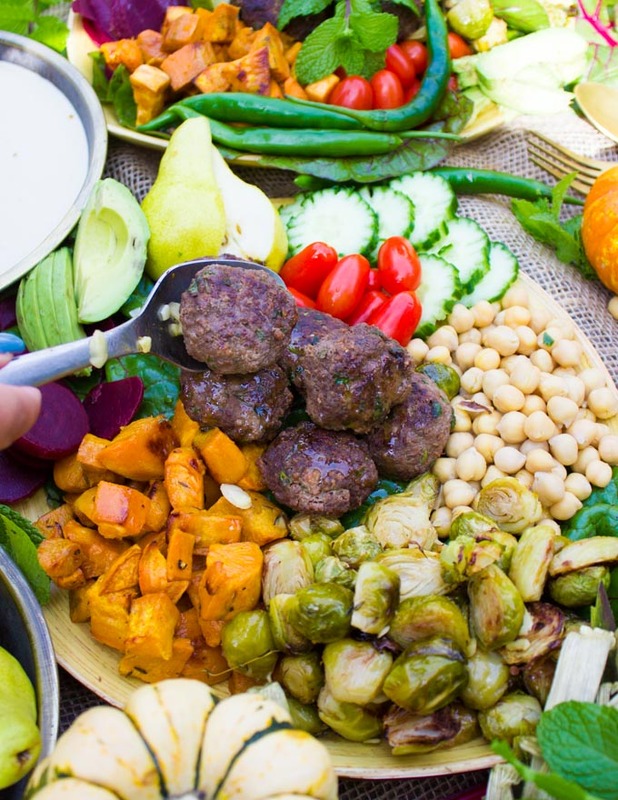 When you’re planning a Fall brunch, this Fall Harvest Bowl with Lamb Meatballs is the perfect one! 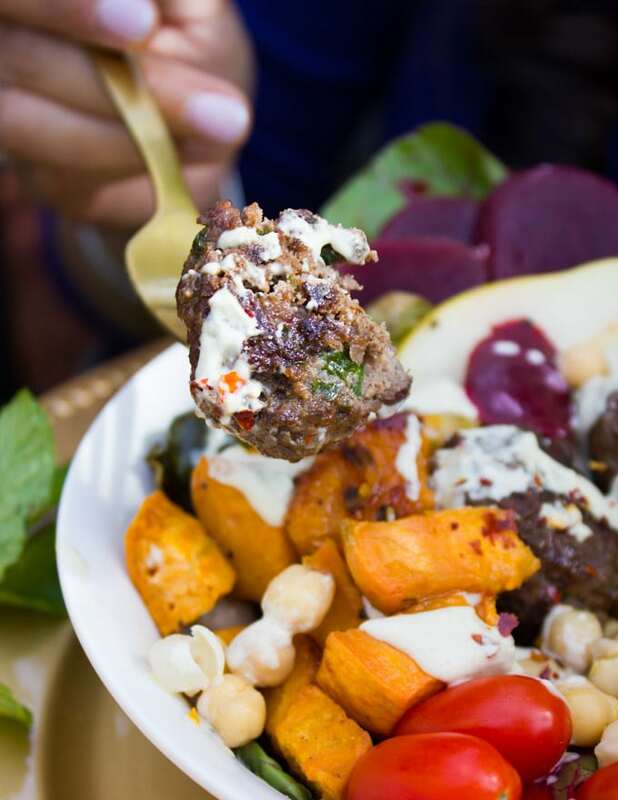 Spicy succulent lamb meatballs, perfectly roasted tender Fall veggies, chickpeas and a luscious tahini sauce on top. I’m excited to share this recipe sponsored by the American Lamb Board. All opinions and thought are mine alone. 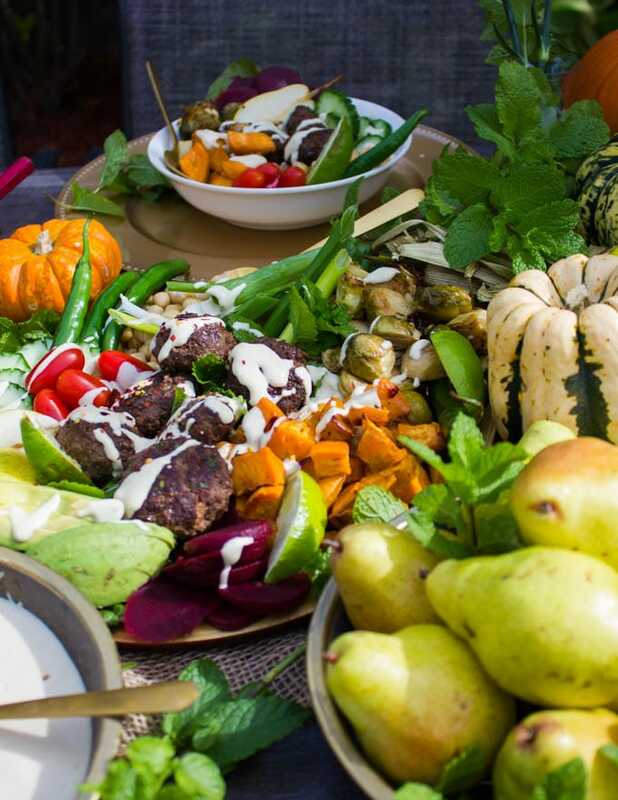 We gathered our favorite pumpkins, fall leaves, veggies and made some seriously delicious American lamb meatballs recipe to go along. It was the perfectly filling and hearty bowl we needed. So GOOD and good for you, you’ll probably make this one with endless variations! 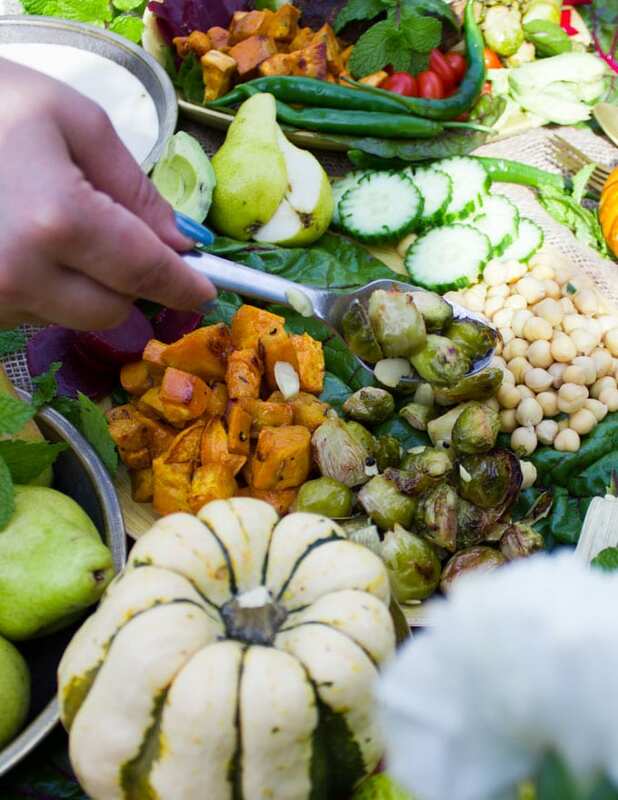 This Fall Harvest Bowl combines the spice, the zest and the sweet. Almost like everything you crave this season in one bowl. I’m using lamb. And yes that’s a good enough reason to make everything taste better isn’t it? 🙂 Ok seriously, if you’ve been hesitant or had bad lamb-ish experiences, it’s time to brush that off and give American lamb a try! Just a quick note here, NOT all lamb tastes the same. Sheep that live on a good diet and get taken care of really well, taste sweet like butter. I’ve been lucky to visit a few American farms and the quality of sheep farming here is unbeatable. So go ahead support your local farmers, and give yourself and your family the joy of high quality lamb! The lamb meatballs recipe I’ve used is a bit different than this American Lamb Meatballs Subs recipe. It’s probably because I needed a more spicy meatball today to pair with the tahini sauce. When it comes to the veggies, I roast them separately (because some cook faster than others) with salt, pepper, fresh thyme and olive oil. Roasting your veggies makes them sweeter and richer in flavor. Another thing I love adding is the sweet factor. So today I’ve used some seasonal fresh pears. Apples would be great here too or persimmons! Now can we talk tahini sauce, again? Have you not made it yet?! As hideous as the photos for this Perfect Tahini Sauce are, the recipe has been a hit on Pinterest. Velvety smooth, creamy, dreamy, and luscious! Tahini sauce is a big deal here. 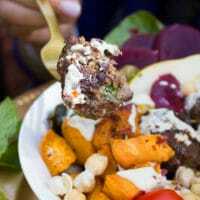 It spikes up the flavors in the Fall Harvest bowls, and it balances the spice in the lamb meatballs recipe. So rather than thinking of swapping it, go ahead and MAKE it! You’ll be hooked, I can promise. I make it the classic way using lime and cumin, however you can totally customize it. Add some garlic, cilantro, parsley or turmeric. There are so many ways you can take tahini to another level, but today I’m keeping it simple and classic. First of all the meatballs. Season your ground American lamb with plenty of fresh garlic, salt, pepper, red chilli flakes, oregano, allspice and a pinch of cumin. You can sear the lamb meatballs and then finish off cooking them in the oven. Likewise you can grill them, broil them or cook them entirely over the stove. I’ll leave this up to you and probably your weather will decide if you can grill or cook them indoor. For the Fall veggies which make this a true Fall Harvest Bowl, I chose Brussel sprouts and sweet potatoes. You can similarly use any type of squash, broccoli, mushroom and any veggies you prefer. A simple seasoning of salt, pepper, oregano and olive oil is all you need. Roast each veggies separately so that each has a chance to cook perfectly. 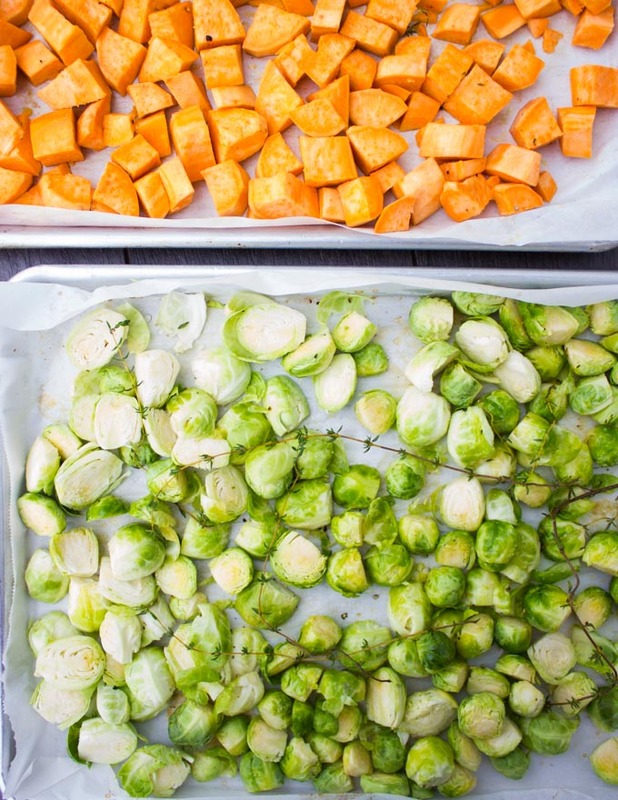 Another thing is to make sure your veggies are in a single layer on the baking sheet so they cook evenly. Now assemble your bowls. You can probably skip this but I love to put a leaf of collard greens at the bottom. It adds an extra layer of flavor and color to your bowl. Scatter the roasted veggies, sliced cucumbers, pears, roasted (or canned) beets, cherry tomatoes, green onions and the meatballs. 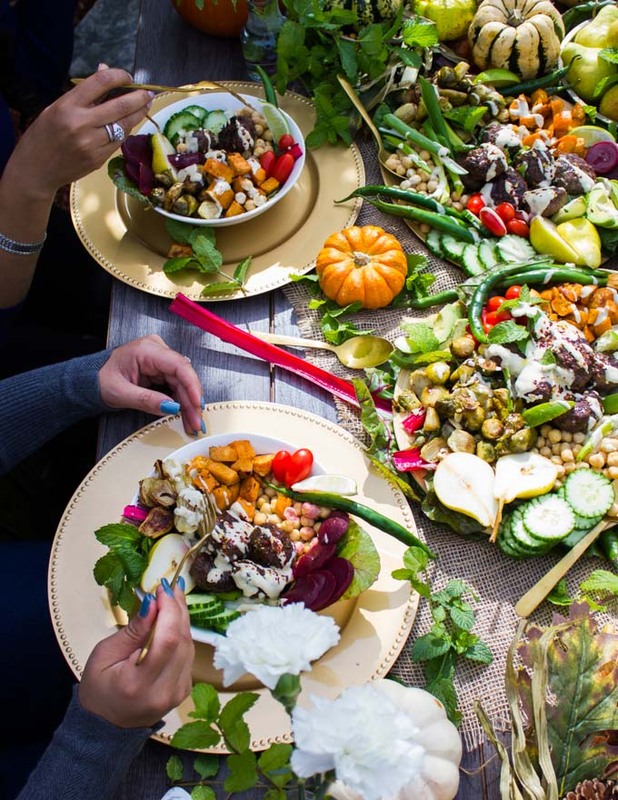 And finally, drizzle up some of the luscious tahini sauce over the entire Fall Harvest Bowl!! 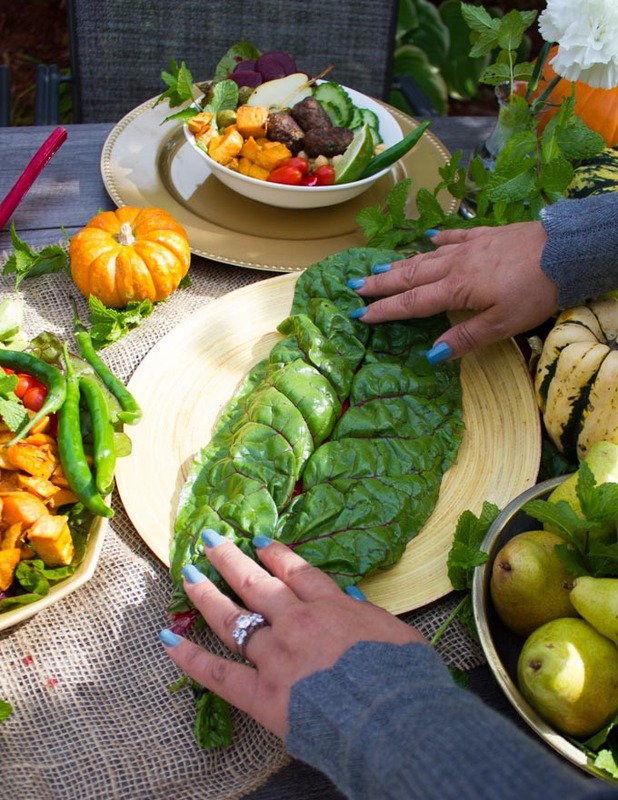 Now gather all your farm fresh pumpkins, some flowers, mint sprigs and scatter them on your dinner table. 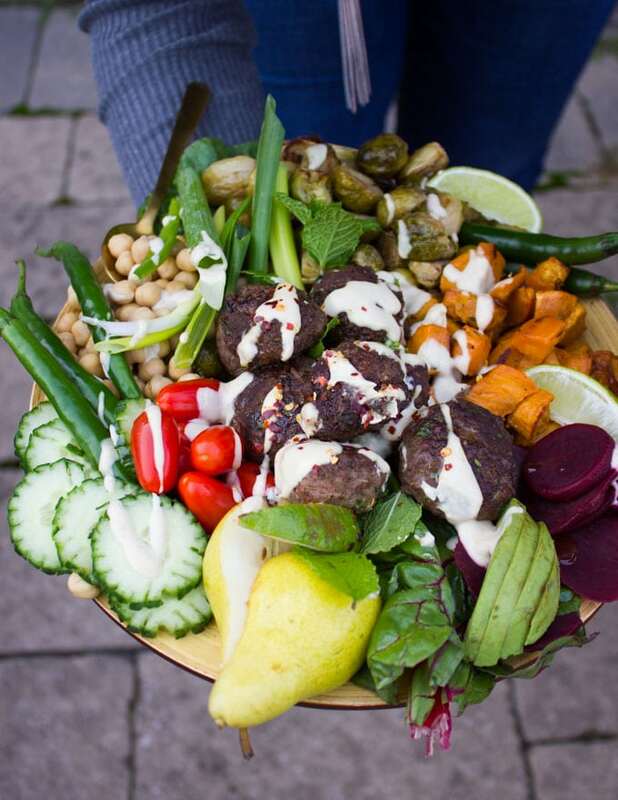 Make a Fall Harvest Bowl Party with Lamb Meatballs and celebrate!! 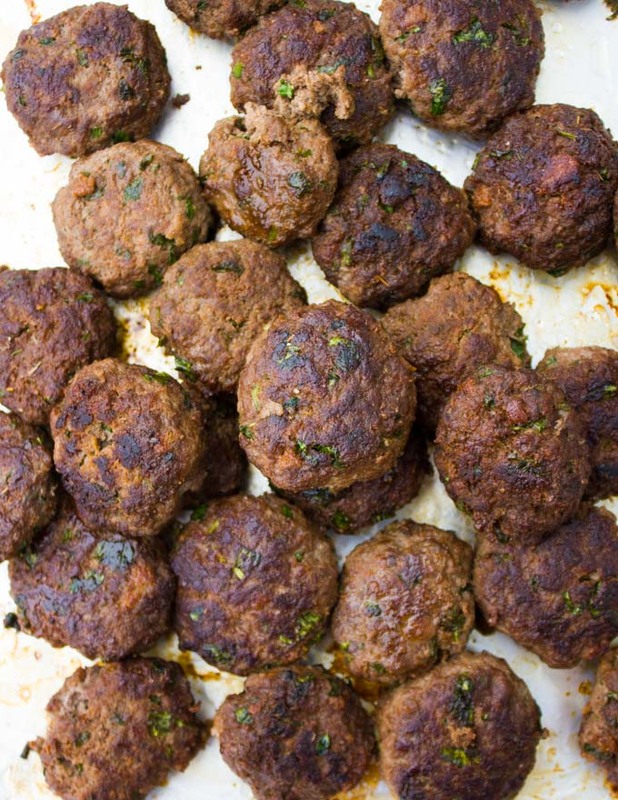 Use American lamb for the best tasting lamb meatballs ever. Ever. Don’t over work your lamb meatballs, because they’ll harden for you. So gently shape them and cook them right away. Roasting each veggie separately is a must to have each veggie cook perfectly. Finally, don’t skimp on the Perfect Tahini Sauce. It’s like the secret flavor balancer ingredient, if that’s even a word? ENJOY! And don’t miss on some more lamb love– Moroccan Lamb and Turmeric Lentil Soup is perfect, hearty and pure comfort! Spicy Harissa Lamb Shoulder Chunks in Pita Cones with Tahini Sauce is a game day favorite, again using the tahini sauce! Line two baking sheets with parchment paper and pace each veggies on a baking sheet. Season the veggies equally with salt, pepper, oregano and drizzle with olive oil. Toss the veggies and roast them until tender. Depending on the veggie, this take anywhere from 20-30 mins. In the meantime, mix all ingredients for the lamb meatballs in a large bowl. Shape the lamb meatballs into an inch and half size balls. Cook the lamb meatballs: Either by searing the meatballs in a skillet over medium high heat with a tablespoon of olive oil until golden and then finish cooking them in the oven for 15 minutes. Or finish cooking them over the stove by covering the skillet with a lid and allowing the meat to cook all the way though—about 20 minutes. Alternatively, you can grill the meatballs too over medium heat, with the lid covered for 20 minutes. All those colours and flavours together sound so good. There’s a lot to celebrate at this time of year! we love lamb and I make meatballs similar at least once a month, I think my only addition to your recipe is garlic cloves and freshly chopped basil. I love the additions in this recipe! I just bought 2 pounds of ground lamb today while grocery shopping. Maybe this is a great place to use it. We love meatballs….and these do sound delicious. What an absolutely beautiful Harvest bowl. I love the combination of flavors and the entire family simply loves lamb. I’ve never used lamb for meatballs but I know it would be a hit. I’m pinning this recipe! Oh my goodness this look absolutely amazing! It truly looks delicious! Is good food and this looks like one of the BEST!! I’m wishing I had a seat at this table! This meal looks amazing! This sounds delicious, all the flavors of Fall that we love in one glorious bowl!! I love the addition of the pears you mentioned, I can never get enough of them. Bookmarking for lunches this week! I always prefer to have veggies on a side when I cook meat. But I don’t think I’ve ever tried tahini sauce with lamb before. It looks exquisite so definitely considering it now – yum! These meatballs look wonderful. I love the idea of putting them in this fantastic, hearty bowl. Great meal prep for the week too! 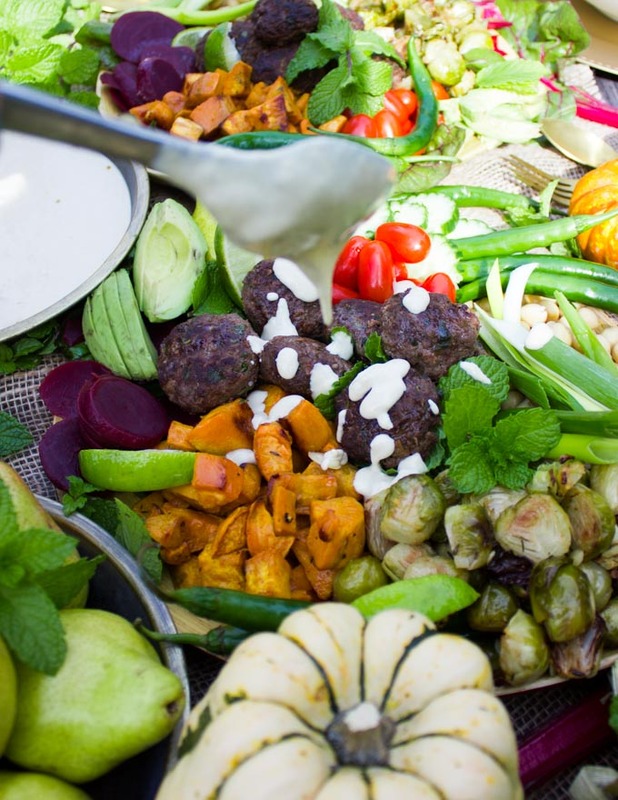 I love all the veggies in this bowl and tahini sauce is my current favorite dressing! My fiance would eat all the meatballs, so this is just a perfect meal for us! Your photos are absolutely gorgeous and the food looks incredible! Those meatballs sound so delicious. 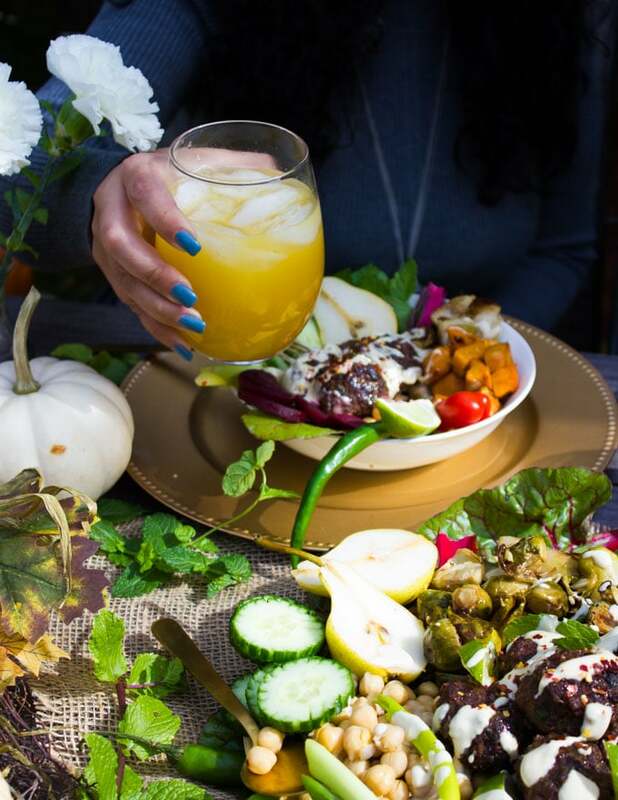 I love the colorful menu that you have put together…truly a beautiful spread for the fall! What a feast. Wow! I love all the flavors and the veggies and the meatballs sound absolutely perfect. Now I’m seriously craving this. So yummy!